one of my new year’s resolutions was to cook a broader range of international dishes. curries were top of my mind a few weeks ago when i was sorting through the mound of recipes that i have cut out of newspapers and magazines, downloaded or scribbled on scraps of paper. 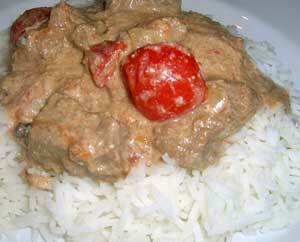 i pulled out several to try but it was a couple of recipes for rendang that jumped out at me. rendang is a curry that originated in indonesia but is also popular in malaysia and singapore. the combination of coconut milk with tamarind paste, the sour fruit pulp that adds an interesting layer of flavour, was too appealing to resist. i made this curry a few days before we ate it and i’d suggest you do the same as this really allows the flavours to meld. the flavour is rich with the different spices but lightened by the acidic tang that the tamarind adds. finely slice one of the onions. chop the other and blitz it in a blender with the garlic and ginger to make a paste. add a couple of tablespoons of the coconut milk and mix together with the paste. put the beef in a bowl and add the paste, mixing so the meat is coated. leave to marinade. add the tamarind and cherry tomatoes and simmer for another 10 minutes. garnish with coriander (as you can see from the photo, i didn't have any in!) and serve with rice. * if you are making the curry in advance this is the stage you stop at.